Recently I had the pleasure of meeting Mari‘s adorable baby daughter Julia. She was wearing the cutest little outfit, including a hand-knit sweater, topped off by a tiny little snap clip barrette in her hair. I had never seen such a teeny tiny barrette. It was so cute that I decided then and there that I would make a project using a set of barrettes just like it. Last year for Valentines Day I made Rose Barrettes using a more normal sized snap clip and they were a big hit. So this year I decided to use the same method to make a smaller heart shaped barrette using these newly discovered tiny snap clips which were surprisingly easy to find at the drug store. They work perfectly in big girl’s hair too. Once I got started I was totally addicted. I ended up making numerous versions and over 40 (!) little barrettes! They were so easy and fun to sew and I loved imagining the babies and little girls I know wearing them on Valentines Day. This is the kind of project that felt was invented for. 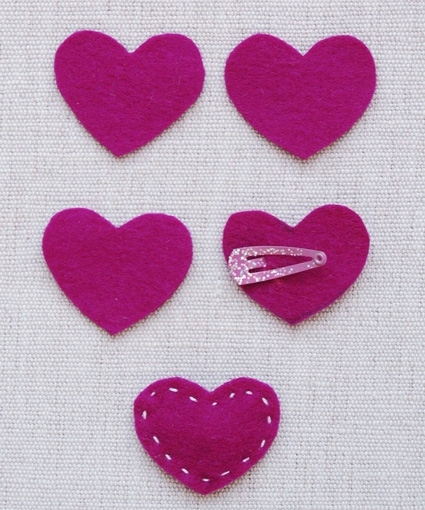 The bright, saturated colors of our Fuchsia felt bundle are so fun and Valentine-y and the fact that it doesn’t need to be hemmed make sewing with it a snap. You could make a few of these for every little girl you know in an evening with no problem! 21 small (3/4-inch long) girls snap-clips. I found mine at a my local drug store. It doesn’t matter what color they are, just make sure they are just the plain clips and don’t have anything extra glued on them. 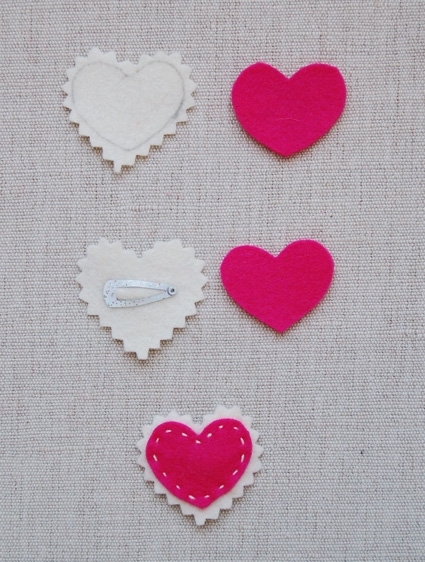 A Valentines Heart Barrette template available for free download here. Slide the arm section of the clip through this little hole and snap the clip shut. The outside of the snap clip will be on the front of the back piece. And the arm section will be on the back side of the back piece. After you sew the felt pieces together as directed for the specific version you are making the back should look like the picture above, with the arm section of the clip exposed and able to open and shut. 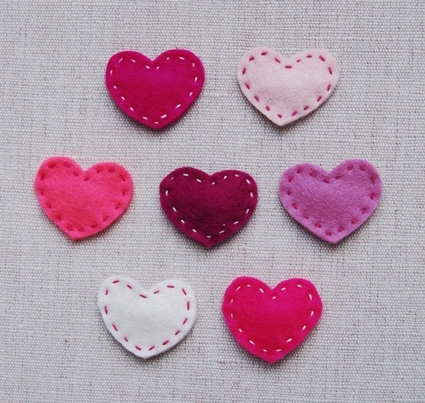 These plain sewn hearts could not be simpler to make! 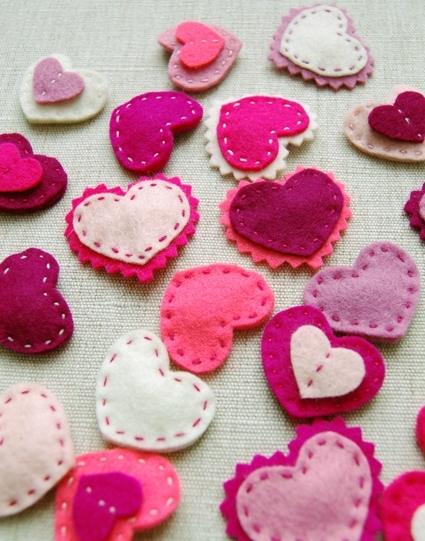 Using the template cut two large hearts from one color of felt, a back piece and a front piece. Attach the hair clip to the back felt piece. Place the front felt piece on top of the back piece so the front piece covers the front of the snap clip. Sew the front piece to the back piece with a small running stitch. Repeat for the remaining colors of felt. 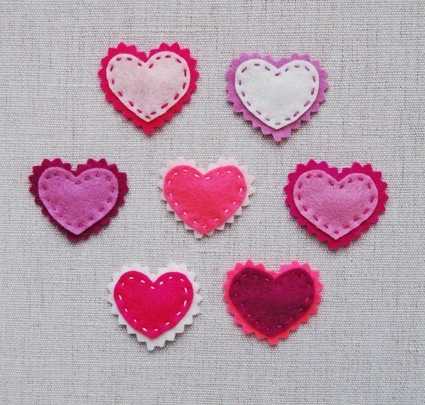 These pinked hearts really look like miniature Valentines! It uses two colors of felt of your choice which will be referred to as color A (for the front piece) and color B (for the pinked back piece). Using the template trace the outline of a large heart from color B with a pencil or fabric marker. 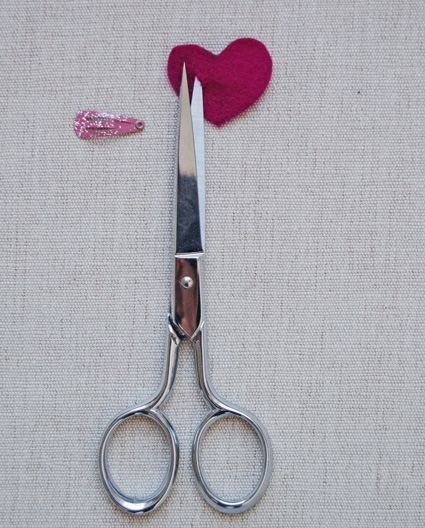 Using pinking shears cut around the outside of this traced marking as shown above. Make sure the zig zags look neat. Flip the (color B) back piece over so that the pencil markings are on the back. Attach the snap clip to the back piece. Place the (color A) front piece on top of the back piece and center it so that the pinked edges are framing it neatly. Sew the front piece to the back piece with a small running stitch. Repeat for other color combinations. 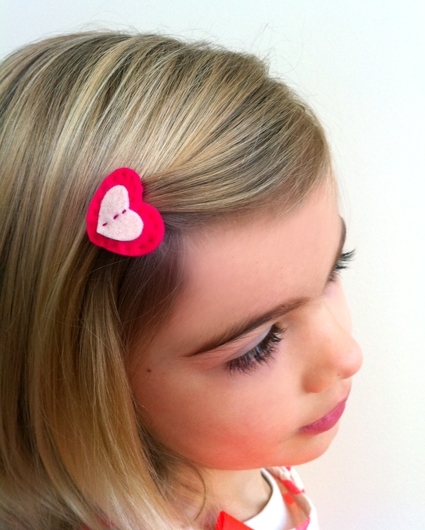 The little hearts within hearts on these barrettes are so sweet and so easy to do! This version also uses two colors of your choosing: Color A for the front and back, and color B for the mini heart. 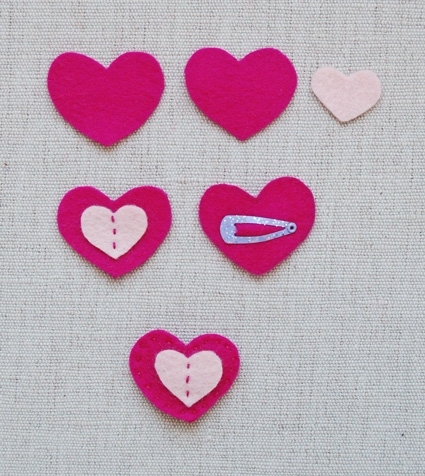 Sew the small heart to the center of the front piece with three small running stitches. 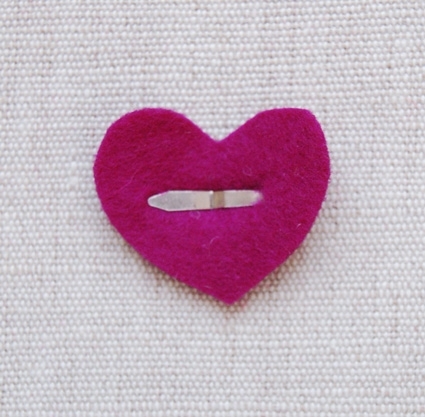 Sew the front piece to the back piece along the edge of the heart with a small running stitch. I loved making the rose barrettes last year and I can't wait to try these. Thanks for the (constant) inspiration! If you cut a little bitty strip of shelf liner grippy material and glue it to the underside of the clip where it touches the hair, it will stay in the hair better. OMg! These are soo cute! And just in time for my nieces birthday party this weekend. I'll be making up an assortment for a birthday present. Anyone know where you can buy those mini clips? I can't find them anywhere! I LOVE these! I'm making them now for all the little girls in the neighborhood! SO cute. Thanks for sharing. I would LOVE to try out some of your 100% wool felt, but it's more expensive than what I can get at my local craft store…so I want your advice and help (sell it to me by telling me why it's better)…will it not pill after use? 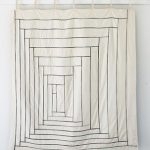 What is the felt from the store made of, anyhow? I'm thinking maybe acrylic? The felt we have is 100% wool and it is absolutely gorgeous. It doesn't pill, it feels great to the touch, it's amazingly easy to work with and the colors are truly spectacular. I'm not sure what the felt is at you local shop, but if it's a lot less expensive then most likely it's not 100% wool. Hope this helps, and please let us know if you have any other questions! Thanks for this super cute, simple idea! A few area moms have asked me to put on a little sewing clinic for their little girls. I think around 12-15 girls will be coming this Saturday to learn to sew! These are going to make a great beginner sewer project that they will love to take home! I decided to put a button in the middle so I can also teach them to sew on buttons. I just tried to purchase you Fuschia felt bundle and it doesn't appear as an option. Is it sold out? Can you recommend an alternative? Thanks! Thanks again and good luck with the barrettes. Thank you for the inspiration. 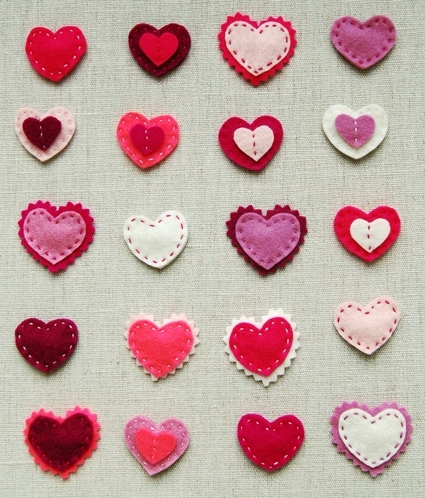 I had crosstitched some hearts for V-day and was trying to decide what to do with them. This gave me a good experiment. I had some alligator clips so I used one of those. What do you think? These are adorable. I can't wait to try them. In the past I have made something similar but just traced the shape of the barrette. They always slipped out of my nieces hair. Maybe because I didn't use wool felt? You ever have this problem? Fantastic tutorial with great pictures! I'm re-blogging it on DIY 4 Canada. Thanks! Looking forward to doing some of these, have not been able to find the really small snap clips, thanks for the sources from all, and thanks, Marcie, for your pics of the larger hearts on a little head, one of my 'heads' is only 14 months old, was worried a larger heart might be too much!! thanks to PB for all the inspiration! These are darling! I bought 2 bags of hair clips at the dollar store, there were 8 pairs on one (they were larger clips) and 10 pairs on another (they were little.) The small clips look EXACTLY like the example shown above. I can hardly wait to make these with my daughter, and I have forwarded the link to several friends. Thanks so much!!! I love these! I asked my daughter if she'd like to give some of these to the girls in her preschool class for Valentine's Day and she, of course, said yes! I've made 11 so far. I used a blanket stitch around the edges. They are so much fun to make! Thanks for the great inspiration! Thank you! These are GREAT! I just made a handful for my 4-yr-old daughter's close friends. 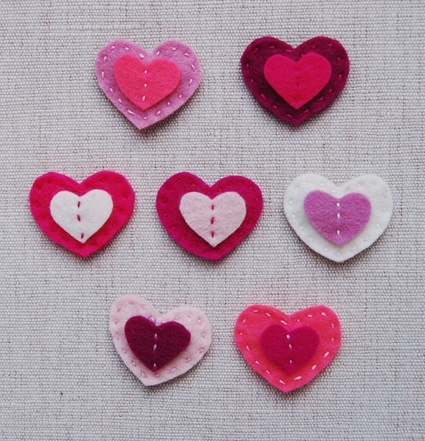 I sewed tiny pearlescent buttons in the center (the kind that come attached to new shirts and sweaters) of one heart before sewing on the base. I only had acrylic felt, so I'm sure they won't last as long as if I had wool, but cute nonetheless. So great! My husband made them for me and my daughter (although I think I'll just wear mine around the house) for Valentine's Day! I just made a whole bunch of these for myself, my roommates, and my other friends. I even made ones in the shape of stars and butterflies. They are so much fun to make and they all love them! How adorable! They come out looking so cute! I tried this and featured it on my blog today. So in love with these barrettes and I am very happy I discovered your wonderful blog! Great tutorial! 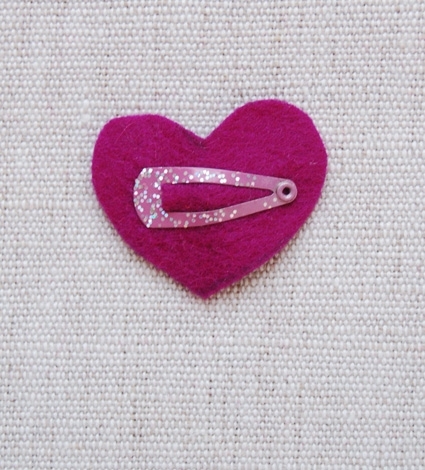 Can you please share how you finish off the running stitch so there is not a knot in the back of the barrette? 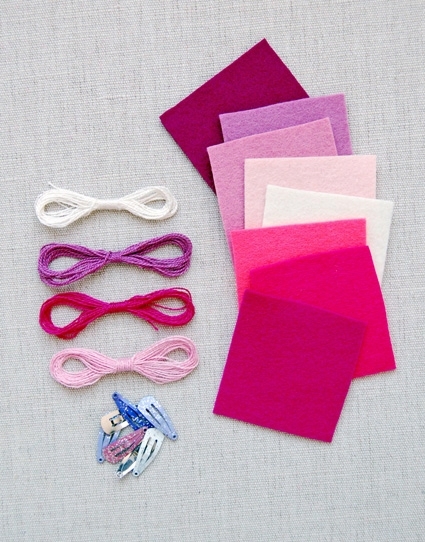 At the end of your running stitch tie a small knot at the end of your last stitch. 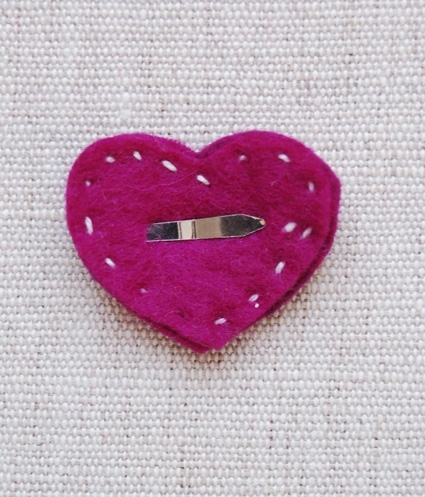 Then pull the needle and thread through just one layer of the felt and out in the center of the barrette. Then clip the thread at the exit point to hide the end.